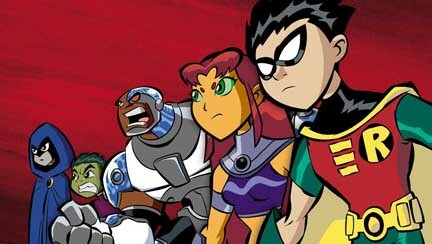 The Teen Titans animated series was featured as part of Cartoon Network's programming at the recent Comic-Con International in San Diego. Among the guests were Khary Payton, who does the voice of Cyborg, and Yumi Yoshimura, one half of Puff YumiAmi, which performs the show's theme song. For a short question-and-answer with Payton, CLICK HERE. For a short question-and-answer with Yoshimura, CLICK HERE. Look for more on Teen Titans soon here in The Continuum. Writers Fiona Avery and Tippi Blevins are teaming on Cursed, a four-part mini-series that ships monthly and begins in October from Top Cow Productions. Romano Molenarr, best known for his work on Lady Death, provides the artwork. Each issue will feature a guest artist providing an alternate cover, including Joe Benitez, Chris Bachalo and Joseph Michael Linsner. "Cursed tells the story of Shan Beaumont, a woman with a secret. She is cursed with the ability to see visions of horrific events and she uses that ability to help her write stories as a journalist. But this curse, placed on her family in the time of Cleopatra, drives people insane. Her own father lies in a psychiatric ward, his mind delving deeper and deeper towards total madness. Shan is asked to help solve a series of gruesome murders while Queen Cleopatra appears in the modern day to help figure out the mystery as well." Avery actually spent some time as an archaeologist before her writing career took off. She got the idea for Cursed's heroine, Shan Beaumont, from her time in the pyramids of Egypt. "It's much more fun inventing the past with some poetic license," she said. Blevins added, "This book reworks some Egyptian myths and sheds new light on some old ones. Ever wondered what really happened after Cleopatra was stung by the asp? You'll find out in Cursed." The winners of the Harvey Awards were announced Saturday night at the Museum of Comic and Cartoon Art in New York City. Best Writer Alan Moore (for Promethea). Best Artist: Eduardo Risso (for 100 Bullets). Best Cartoonist: Jeff Smith for Bone. Special Award for Excellence in Presentation: Krazy and Ignatz (Fantagraphics). Best Continuing or Limited Series: The League of Extraordinary Gentlemen by Alan Moore and Kevin O'Neill (ABC). Best Single Issue or Story: The League of Extraordinary Gentlemen, Volume II, #1 by Alan Moore and Kevin O'Neill (ABC). Best Graphic Album of Original Work: The Cartoon History of Universe, Volume III by Larry Gonick (W.W. Norton). Best Graphic Album of Previously Published Work: 20th Century Eightball by Daniel Clowes (Fantagraphics). Best Anthology: Comics Journal Summer Special (Fantagraphics). Best Inker: Jaime Hernandez for Love and Rockets. Best Letterer: Todd Klein for Promethea. Best Colorist: Dave Stewart for Hellboy. Best Syndicated Strip: Mutts by Patrick McDonnell. Best Biographical, Historical, or Journalistic Presentation: B. Krigstein, Volume 1 (Fantagraphics). Best Presentation of Foreign Material: Lone Wolf and Cub (Dark Horse). Best Domestic Reprint Project: Krazy and Ignatz (Fantagraphics). Best New Talent: Nick Bertozzi for Rubber Necker. Best Cover Artist: Adam Hughes for Wonder Woman. In case you missed some of The Continuum's recent coverage from Comic-Con International in San Diego, here are some links. * For stories from Preview Night, including an interview with Mike Mignola about the Hellboy movie, CLICK HERE. * For the CrossGen Comics panel, CLICK HERE. * For the WildStorm Productions panel, CLICK HERE. * For a look at the Hellboy movie trading cards, CLICK HERE. * For a look at the Batman: Mystery of the Batwoman movie, CLICK HERE. * For DC Comics' Batman panel, CLICK HERE. * For DC Comics' Vertigo panel, CLICK HERE. * For the Spider-Man sequel panel, including a first look at Doc Ock, CLICK HERE. * For comments from Hugh Jackman and Halle Berry about appearing in a third X-Men movie, CLICK HERE. * For the Smallville panel, CLICK HERE. * For an interview with Spider-Man 2 producer Avi Arad, CLICK HERE. * For DC Comics' super teams panel, CLICK HERE. * For Phil LaMarr talking about the Static Shock/Green Lantern team-up, CLICK HERE. * For the Hellboy movie panel, CLICK HERE. The Wednesday, Aug. 20 episode of The WB's Smallville will be a repeat of "Skinwalker." The League of Extraordinary Gentlemen placed ninth at the box office over the weekend with $3.1 million, pushing its total to $58.8 million.